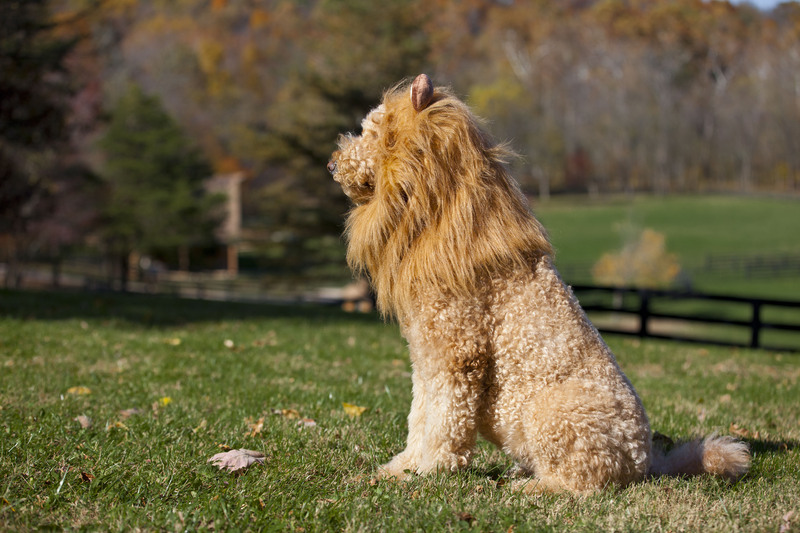 I’d be “lion” if I said I wasn’t proud. Fame and Fortune!! Well, maybe not so much on the fortune. 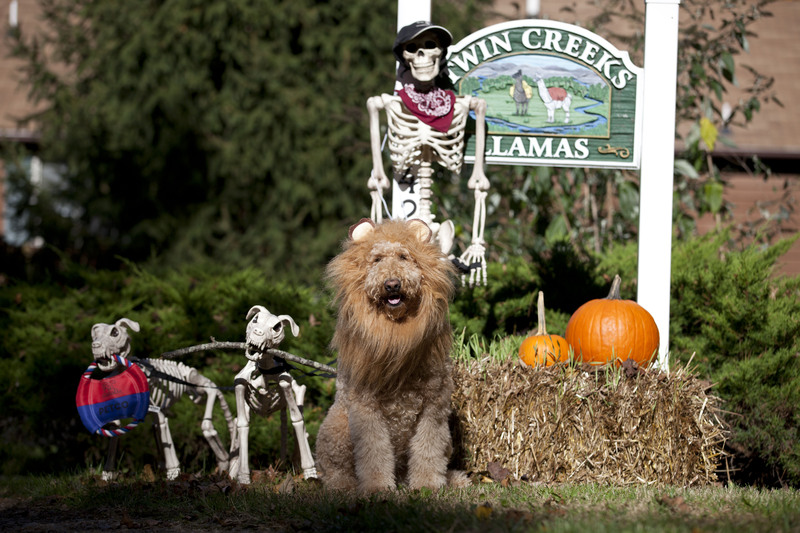 My Nephew, Kent, Kent Corley Photography, took these photos October 2014, for a Halloween Photo Contest that AKC was running at the time. We didn’t win the contest, but Kent was contacted by the “Daily Mail” in the UK last month and asked permission to publish the photos in an article. I just happened to hit upon this today as I was googling my name. (Yes, I will admit, I do this once and a while). I’m just bustin’ out with pride for my doggie, and for my nephew Kent Corley. I’m living with an international celebrity. I’m trying to decide whether or not to tell her. 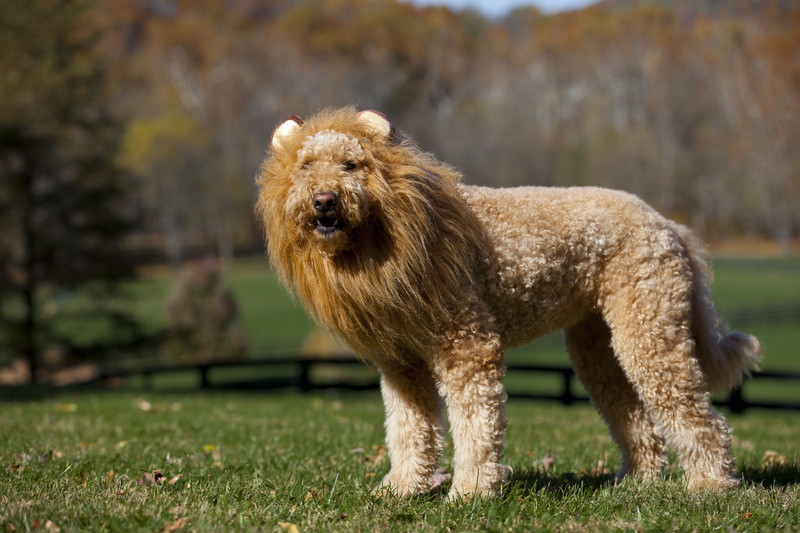 “This dog looks convincing as a lion in a Virginia pet costume contest. This invariably leads to me having to buy a new spice or condiment to make the new dish. If I were asked to name my greatest strength and my worst fault, I think the answers would be the same. I am organized. Not quite to the OCD level of organized, but maybe not so far off. I like things to be arranged alphabetically whenever possible. And spices lend themselves to that very well. Except when you accumulate so many that they wind up all over the kitchen. 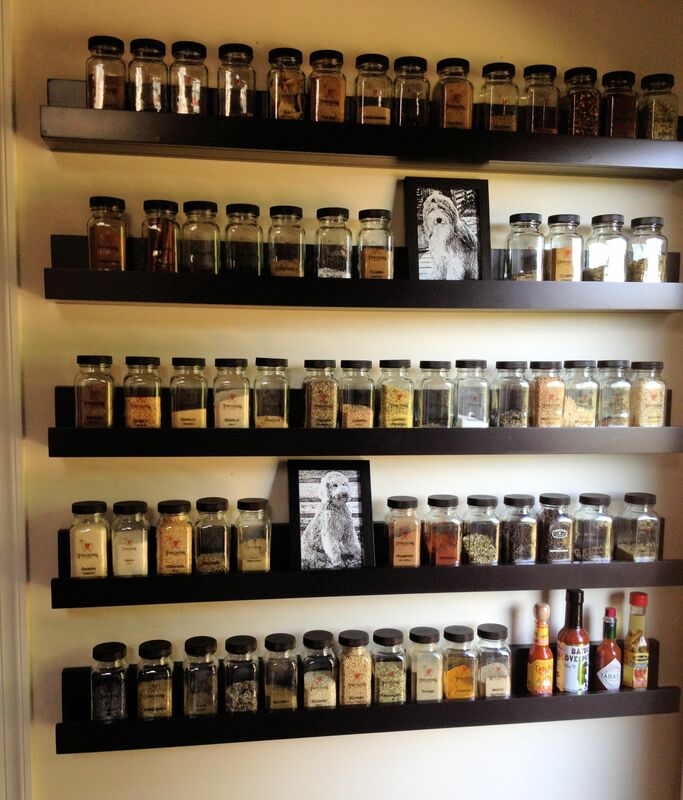 My very first spice rack was a gift from my dear Road Warrior, on our very first Christmas together, 40 years ago. It held 18 bottles of spice and it served me well for several years. Then I had a couple of racks that sat on the kitchen counter that held an additional 24 bottles. Plus there were two 2 tier lazy susans in the cupboard above the microwave that stored who knows how many more bottles. Each spice cabinet was alphabetically arranged, but I could never remember which cabinet was hiding the particular spice that I needed. And I always had to drag out the ladder to see what was lurking in the top cupboard. 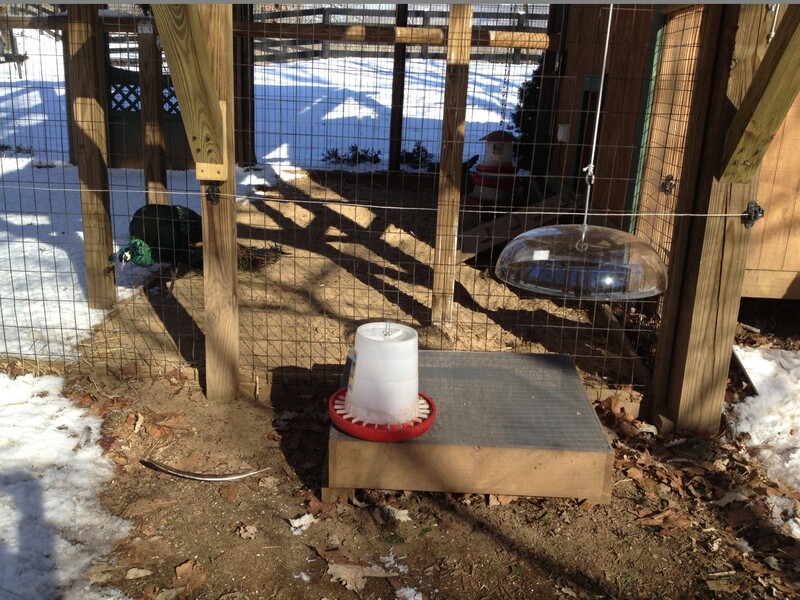 I’ve been pondering on a better system for a couple of years. It seems like all the spice racks on the market assume that 12-18 spices is all you should ever need. (At present, I have a total of 63 bottles of different spices). I soon realized that I was going to have to be creative and come up with a design of my own. I scoured the internet for ideas, and took a bit here and a bit there and finally found all the pieces I needed to make my perfect spice system. One thing I wanted to eliminate was the backup spice bottle. 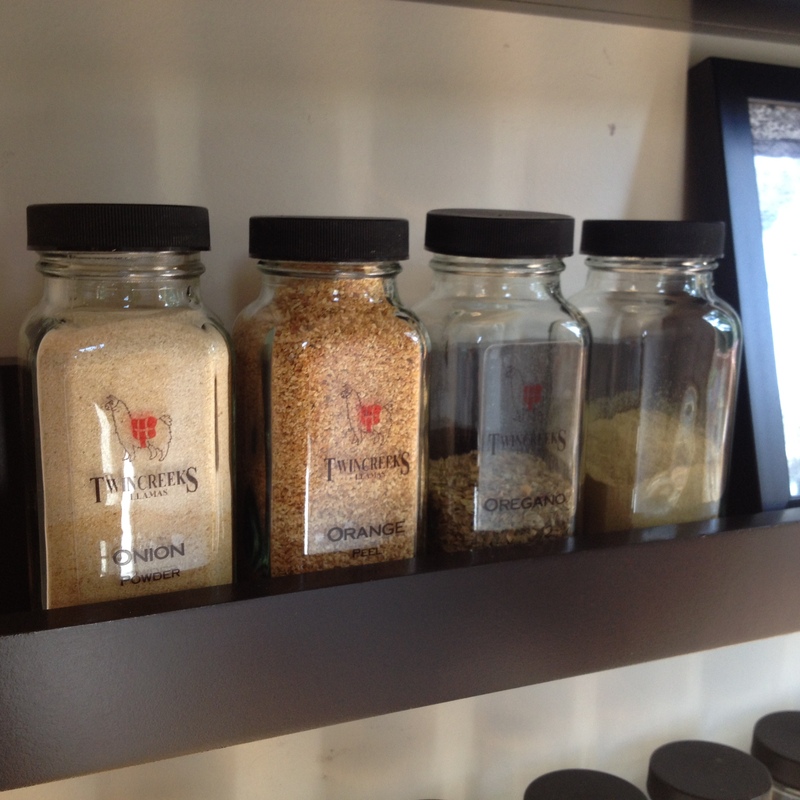 You know, you’ve got this spice rack with its own decorative bottles. So you’re getting low on cinnamon, you buy a jar and dump it in the decorative bottle, and you still have a quarter of a jar left in the ugly grocery store tin, so you put it in the cupboard till you need more. So you’ve now got duplicates on top of the 63 original spices. So I found these wonderful 6 oz. bottles that will hold just the right amount. Actually, I first saw these bottles at Target. This is what they sell their own brand of spices in. After Googling awhile, I finally located them. They are called French Square Bottles. The shelves are actually photo ledges. Google to the rescue again. And I used a clear glossy label and my own llama logo to create the name tags. 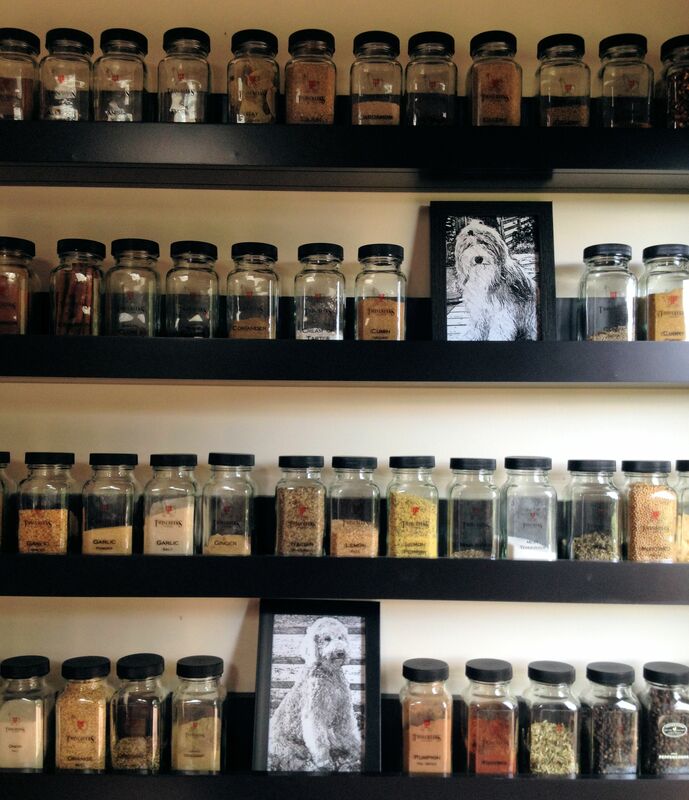 I actually have a little room for expansion, so for right now, there is just enough room to display photos of the real spices in my life….my pups…. 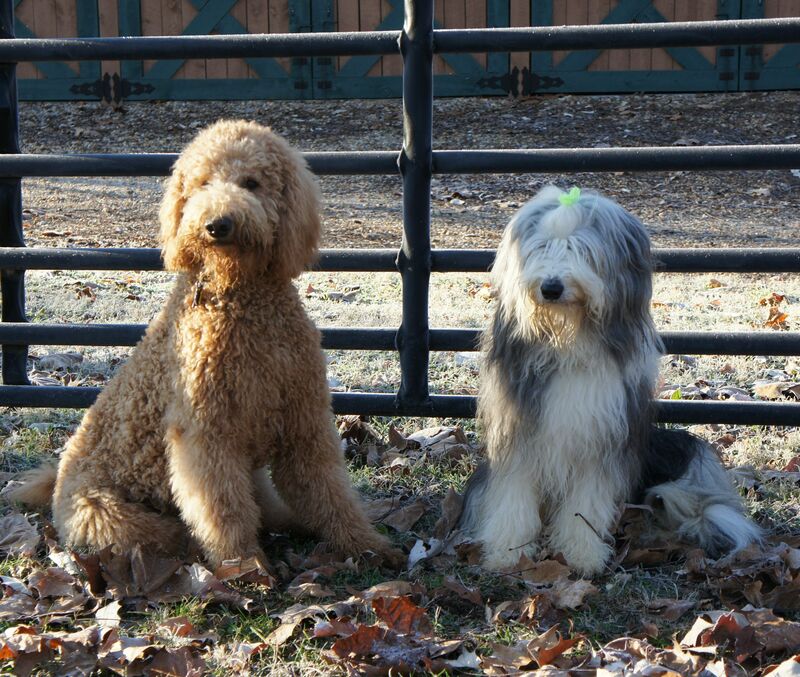 Mayzie and Bayley. 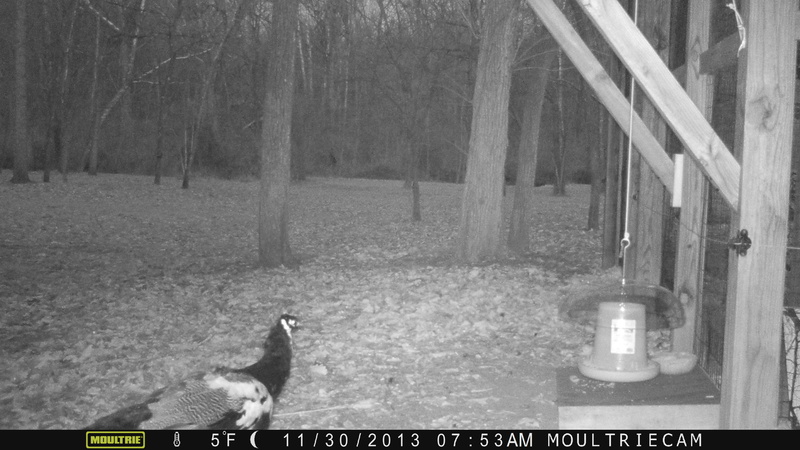 Well, after our peacock feeder tray was destroyed a couple of weeks ago, we have had two game cameras focused on the area to see if we could catch the culprit. 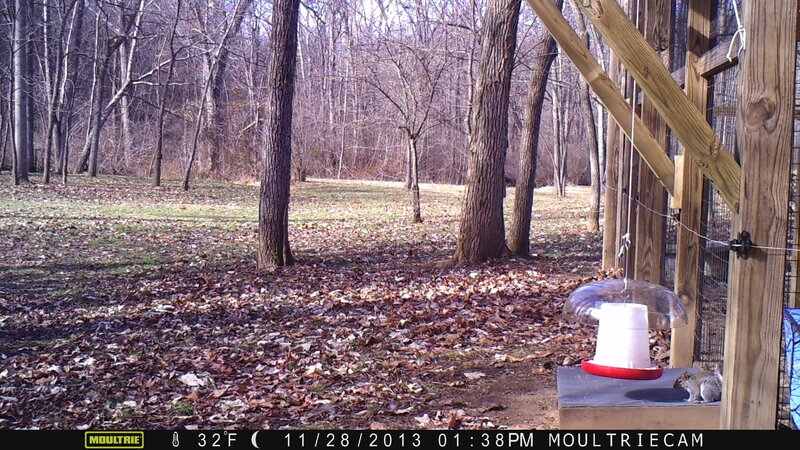 It’s amazing how crafty and smart those critters are. 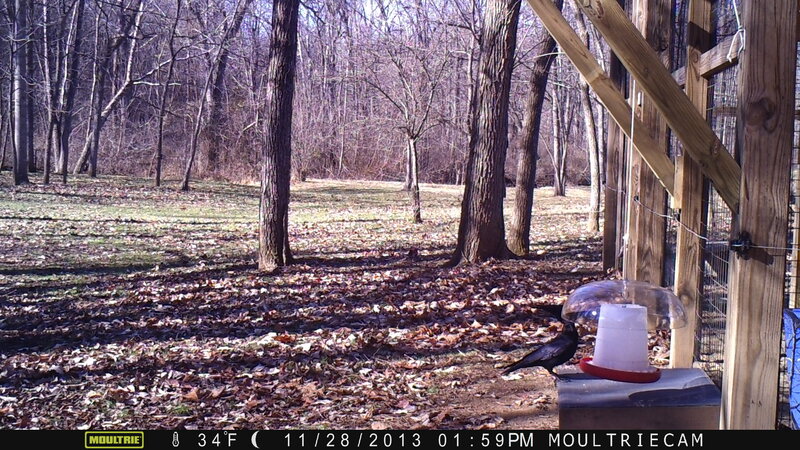 He had unscrewed the nut and bolt holding the feeder to the hook and knocked it to the ground. Amazingly all the tiny parts were right there in a pile, so it was easy to reassemble. 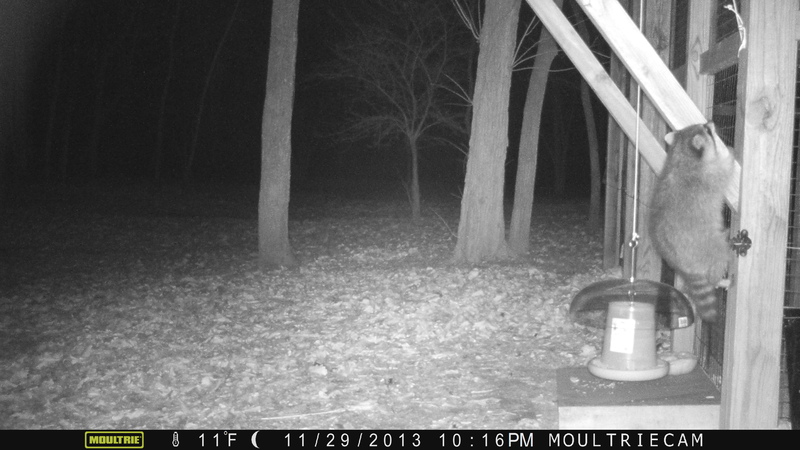 More amazing still was that the next night, he figured out how to lift the feeder off the hook without taking it apart. 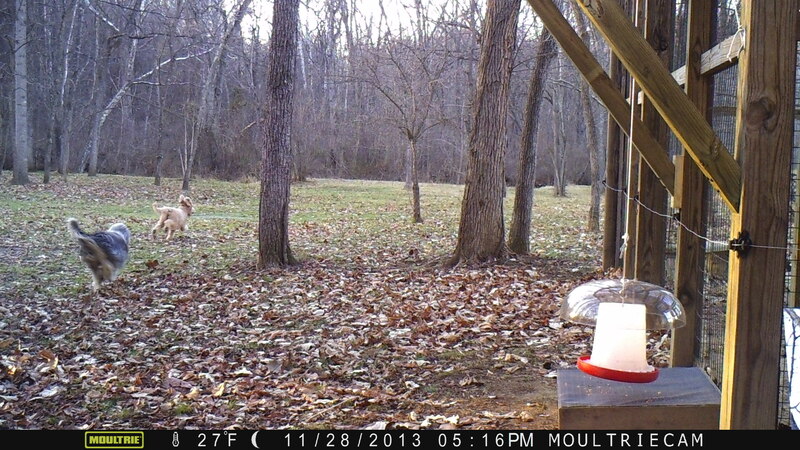 It’s scary when you are trying to match wits with the wildlife and you realize you are losing. Well, Isn’t That Just Beachy? Do you have a special place from your childhood, a place that you long to revisit in hopes of recapturing that perfect, carefree happiness of youth? For us it is the Grand Stand of coastal South Carolina. 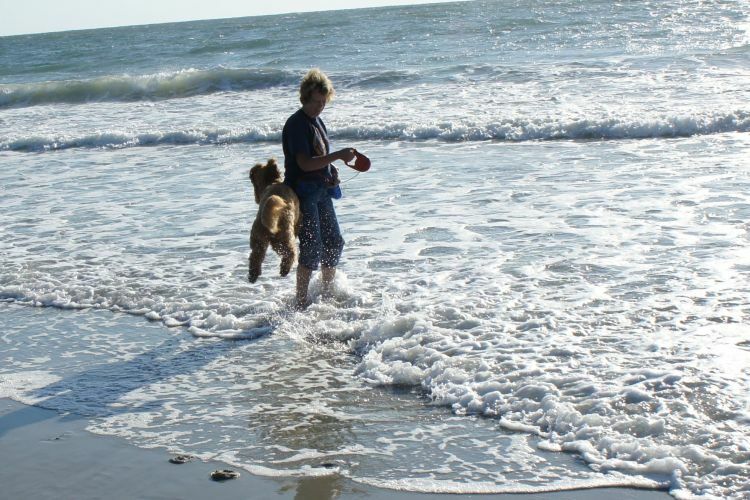 For as many years as we can remember, we have been making an annual pilgrimage to the beach. Autumn is our favorite time of the year. The weather is cooler and the kids are back in school. 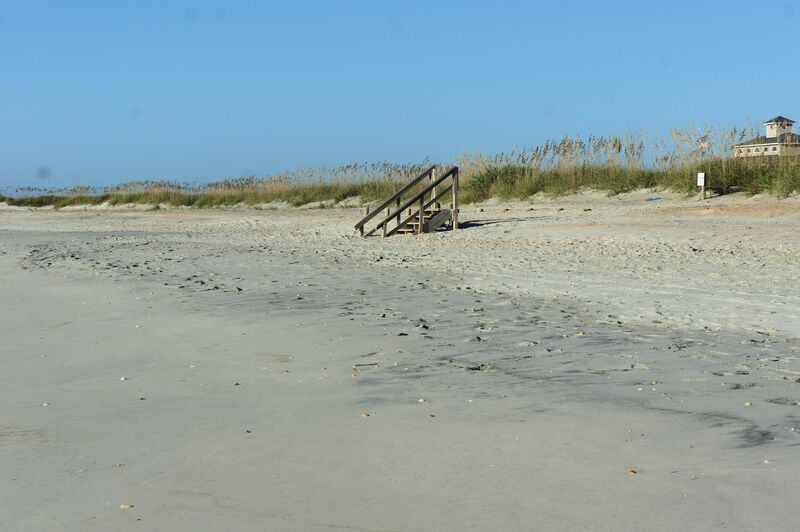 And if you roust yourself out of bed early enough, you can have the whole beach to yourself. 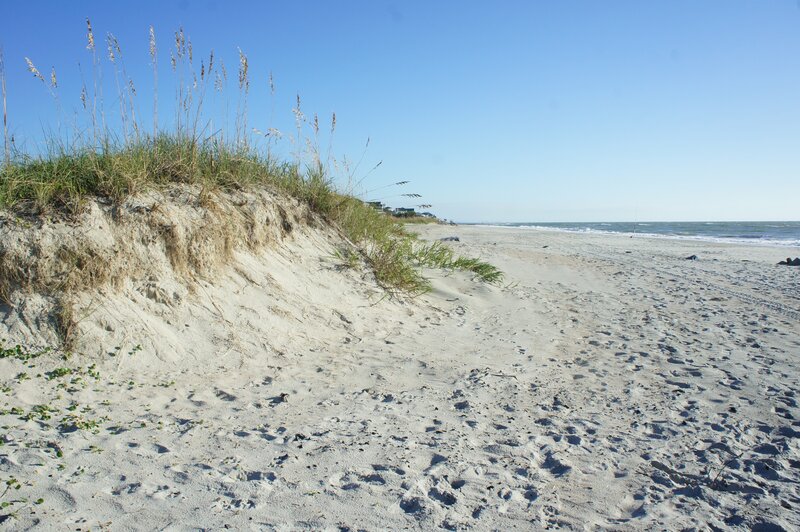 Miles of white sand, interrupted only by the scurrying clusters of sandpipers. Last week was our annual trek to the beach. 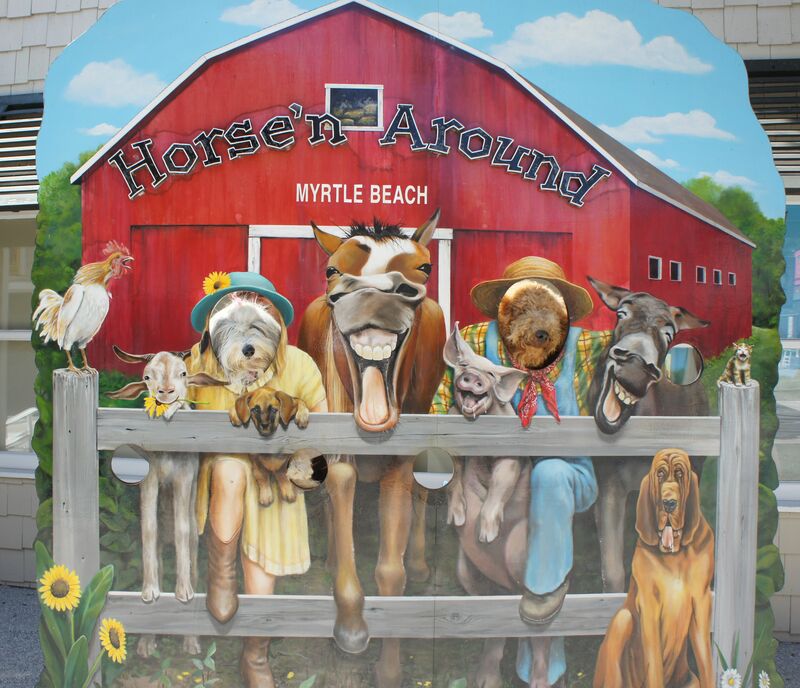 It is as much a vacation for the doggies as it is for us. 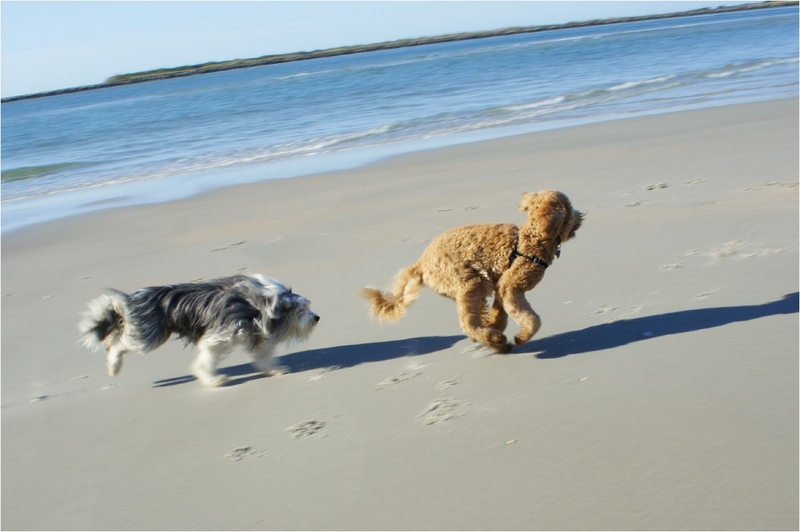 There is just something about splashing in the surf and dashing in the sand that turns all dogs into puppies. 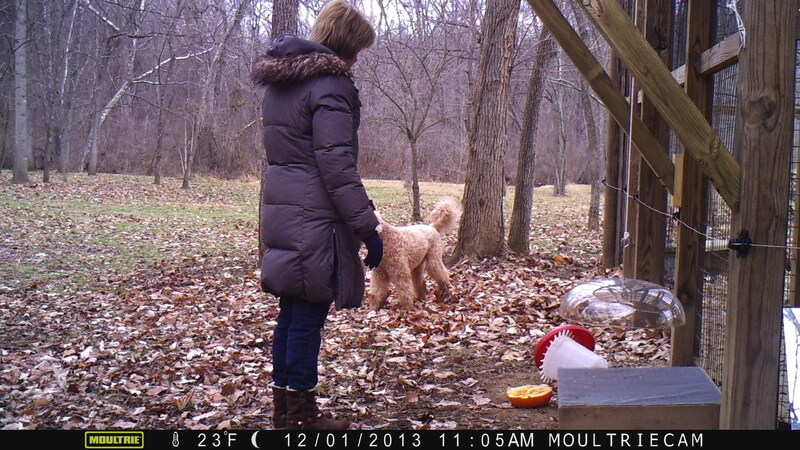 Bayley, the golden doodle, is very tentative about anything new. It took her a while to warm up to the breakers. Water in our pond isn’t nearly as aggressive! There are several stores and restaurants in the area that allow dogs. 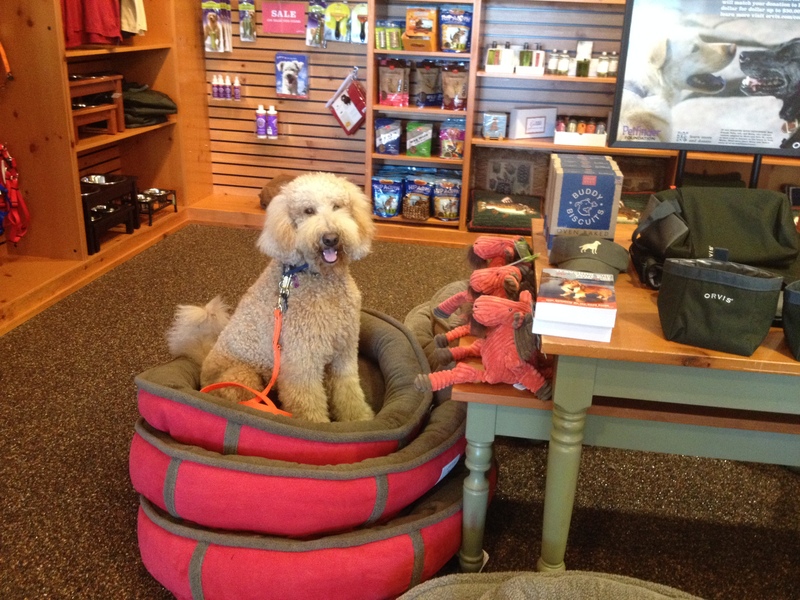 One of our favorite stores is Orvis. Bayley wanted to try out the dog beds. It turns out she is a princess. Who knew? We had to stack three mattresses before she couldn’t feel the offending pea. 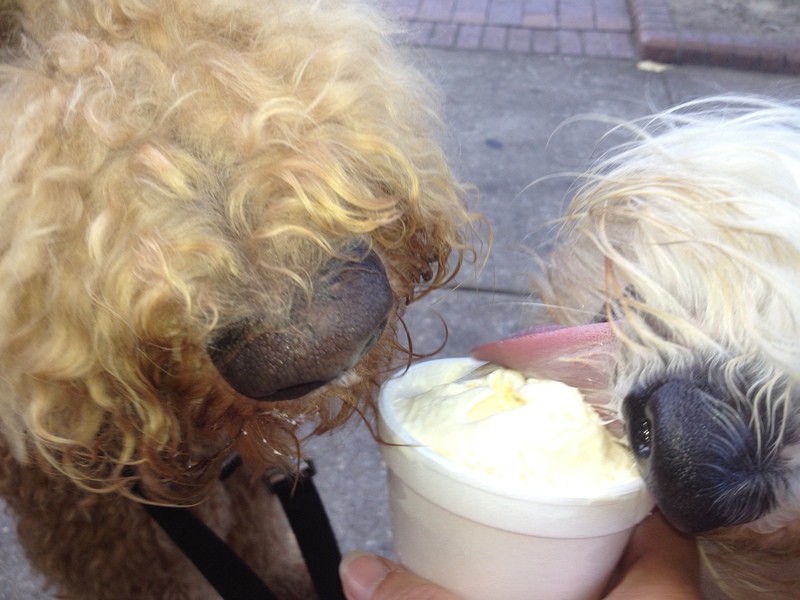 Bayley wasn’t keen about making the acquaintance of the concrete cow in front of the ice-cream shop…. 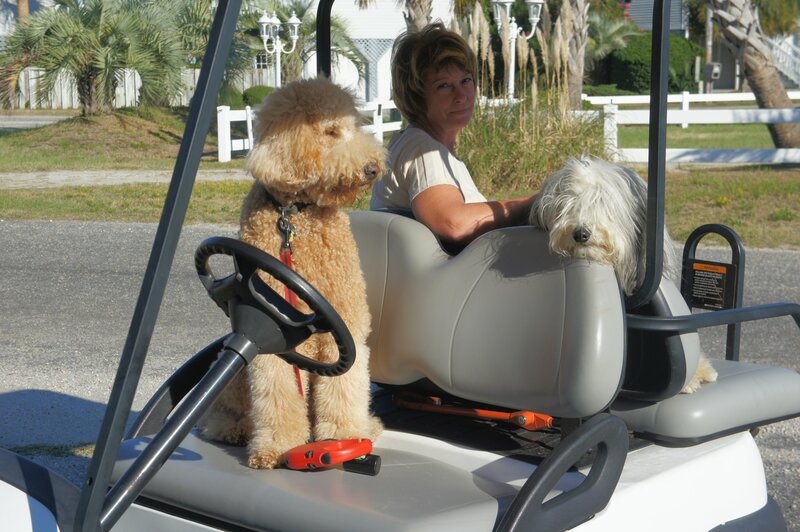 The dogs loved doodling around the neighborhood in the rented golf cart. Here is a photo of Bayley “Driving Miss Mayzie”. 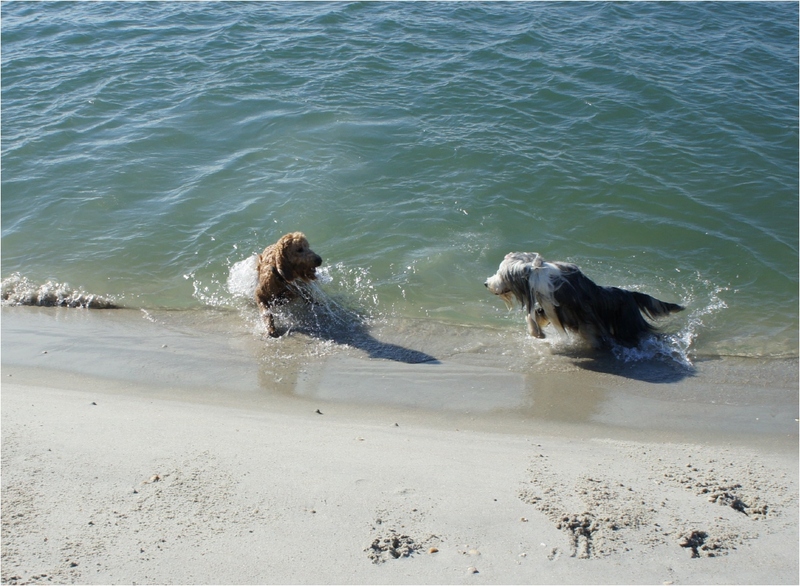 But nothing topped the joy of a romp on the sand. Ah, the beach…. Perfect serenity… An early morning stroll and the world is your oyster. 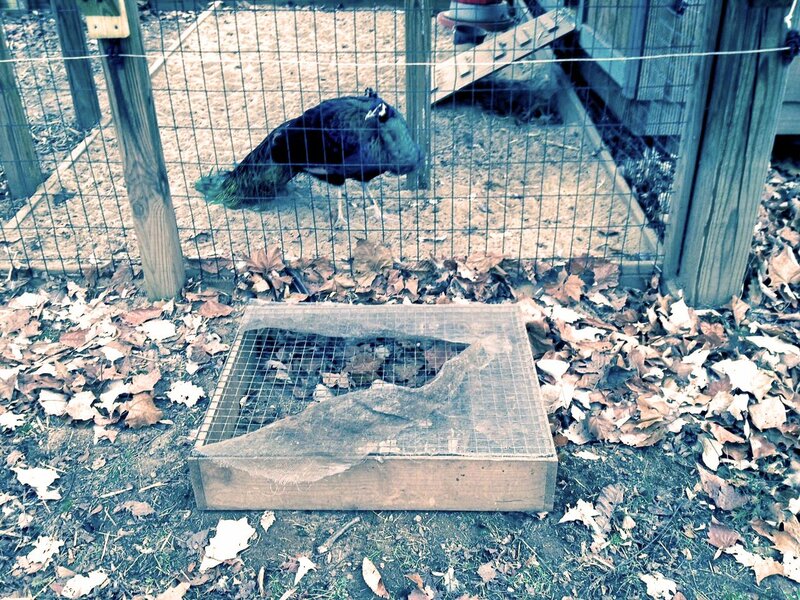 In my opinion, you are never too old to enjoy a day at the county fair. A day on the midway just brings out the kid in you. 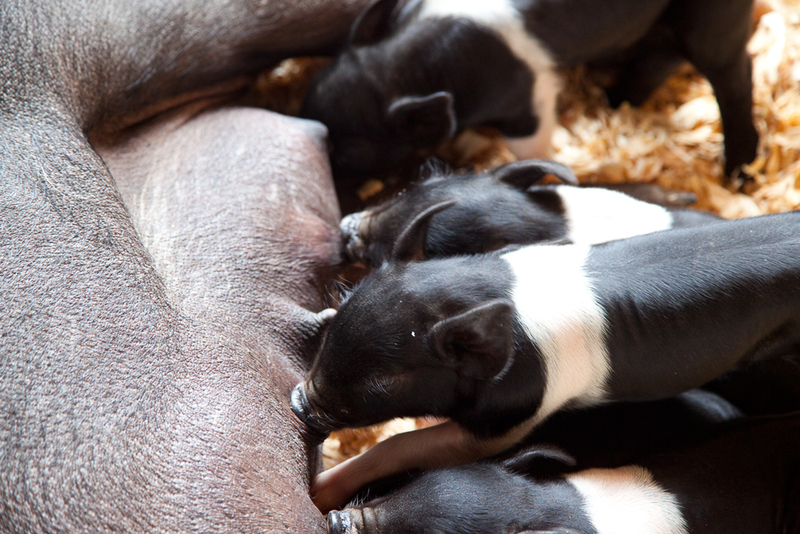 All the splendid smells battle for your attention; the greasy smell of fries and funnel cakes, the cloyingly sweet smell of spun cotton candy and spiced almonds, the earthy smells wafting from the livestock barns…. But, according to my Road Warrior, the smell of burning diesel fuel is something akin to perfume. 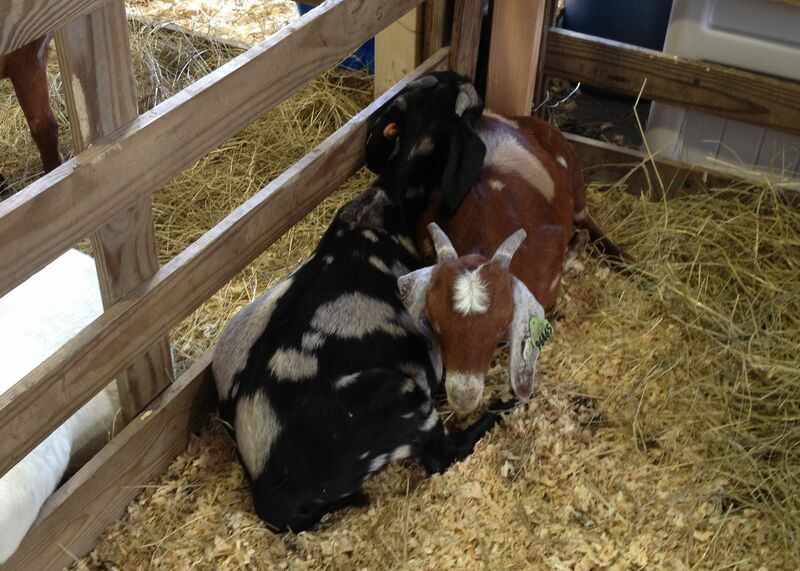 Every year, like a rite of summer’s passing, we always go to the Shenandoah County Fair. 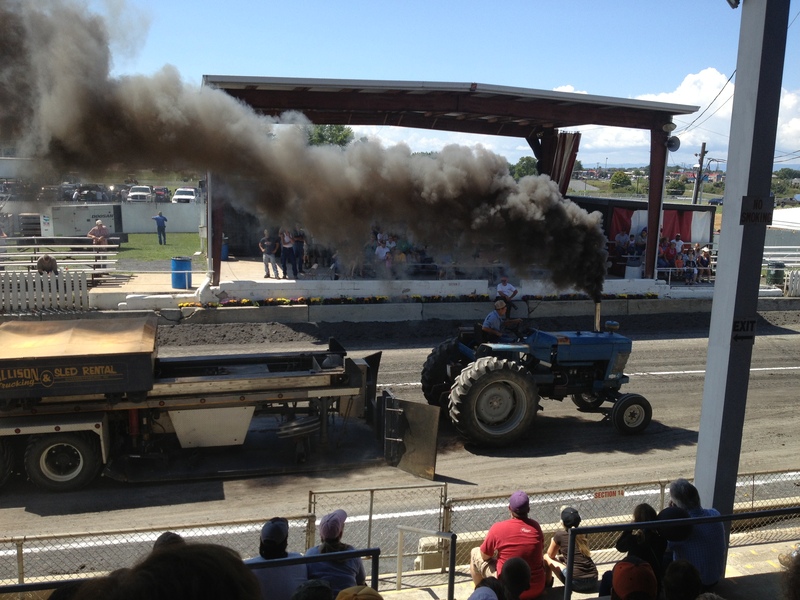 And the highlight of the day is the tractor pull. Farmers from all across the land bring their iron work horses, many still plugging away after half a century of hard work, and compete to see who can drag a heavy weight the furthest down the track. Amidst belching smoke, spewing dust, and ear splitting unmuffler-ed engine roar, we sit in the bleachers, eating corndogs, and cheering them on. It’s loud, it’s smelly, it’s dirty, and it’s FUN. Then for a tour around the midway, we toss all dietary concerns to the wind, and sample our way through the mélange of greasy foods. 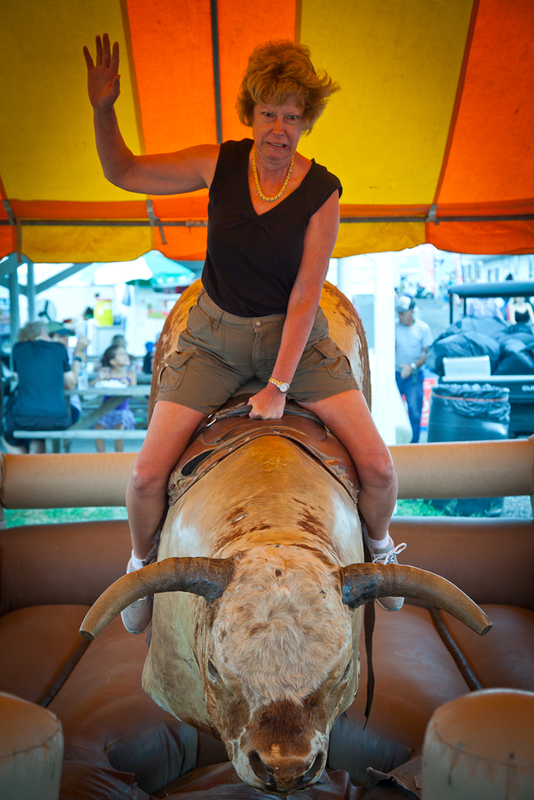 I learned last year that there is an age at which one must gracefully withdraw from the stomach churning, gravity defying carnival rides, but I did enjoy a spin on the broncing bull. And we tried our hands at a couple of the midway games. Some games you just know that the odds of winning are astronomical, but there is one game where there is a guaranteed winner every time. This is the one where you aim a water pistol at a target and the first person to get their horse to the finish line first wins. I WON. First time. So I got my pick of prizes. 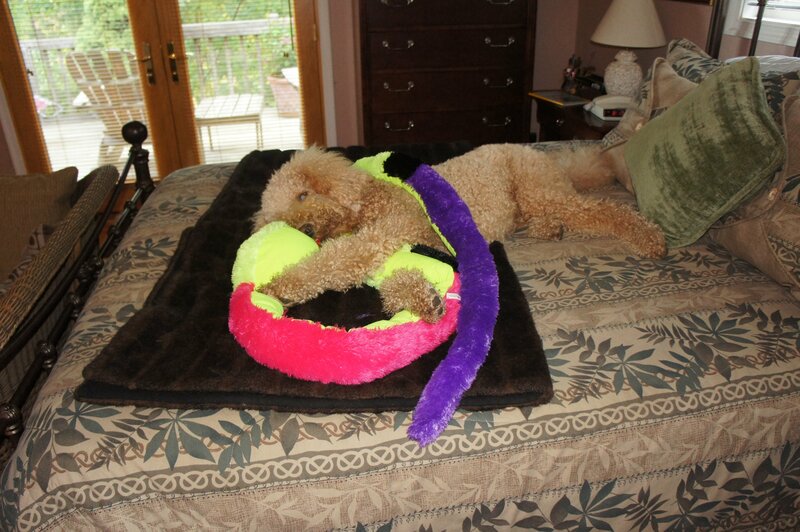 I chose the giant snake for Bayley. All in all, it was a FAIRLY good day. Ever just have the TV on for background noise? Our TV is on anytime one of us is in the house, but we rarely actually sit down to watch anything. Such was the case last week when my attention was captured by a chef showing us how to make gazpacho. So what’s so exciting about that? Gazpacho is gazpacho. But there, my friend, you are wrong. This was Watermelon Gazpacho, and it was weird enough that I stopped what I was doing to watch him toss the garden into a blender. My friend is a retired dental hygienist (for people) who has been scaling her own dogs’ teeth for years. 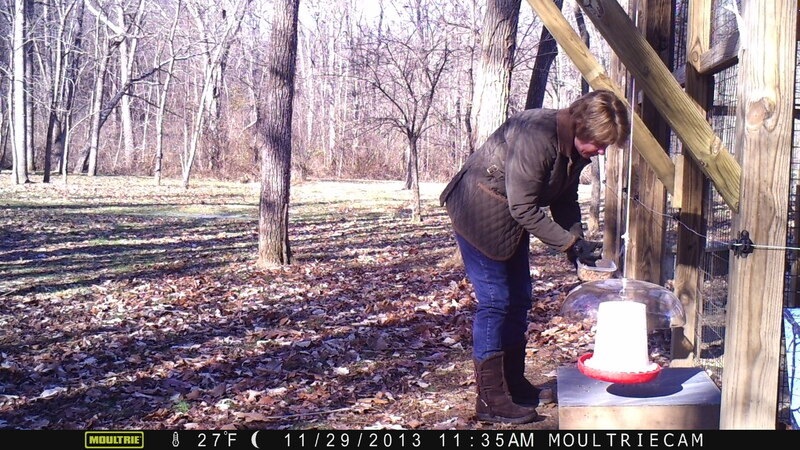 She offered to drive an hour and a half out to the farm to clean my two dogs’ choppers. She does this without anesthesia. 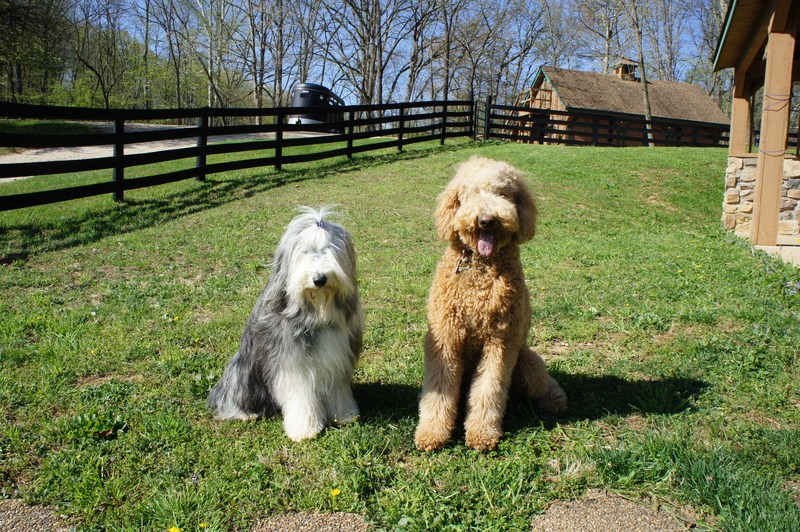 Mayzie, the bearded collie, behaved like an angel. But I didn’t expect anything less of her. She is a perfect lady. 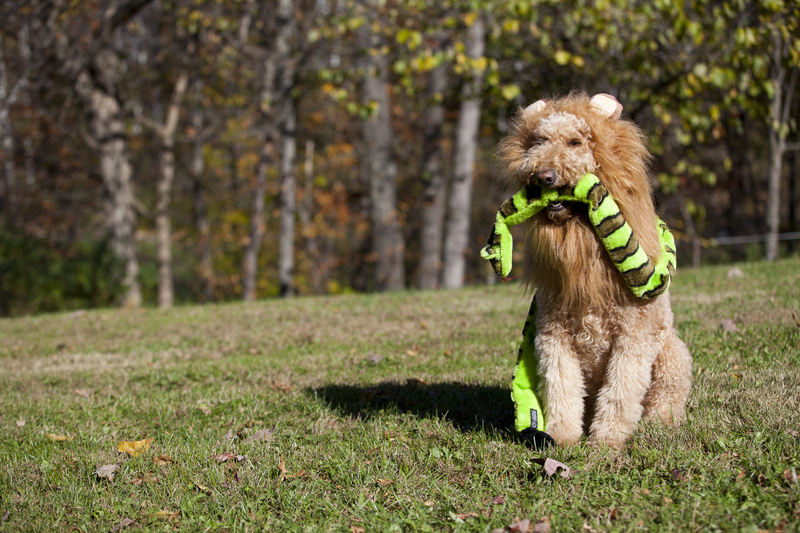 Bayley, the year and an half golden doodle, on the other hand, wasn’t quite so easy. But with Bayley on her side, and me laying fully stretched out on top of her, we were able to keep her still enough to finish the job. Both dogs were over and done with in less than half an hour and it saved me at least $600 over having the vet do it. So the least I could do was to make lunch. I served the Watermelon Gazpacho and Cucumber Tea Sandwiches. And the soup was DELICIOUS! I checked out a dozen or more recipes online and combined bits and pieces of several recipes to come up with my own signature dish. I’m going to show you how I made it. It’s super easy. 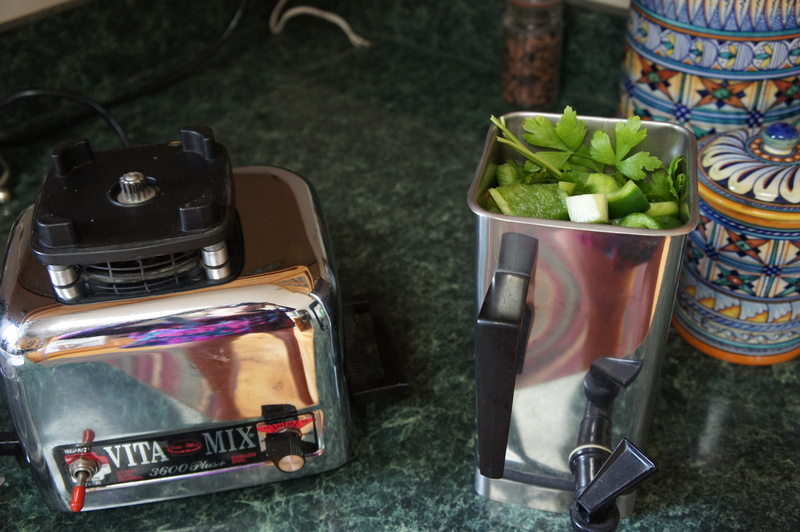 You can use a food processor, or a heavy duty blender. 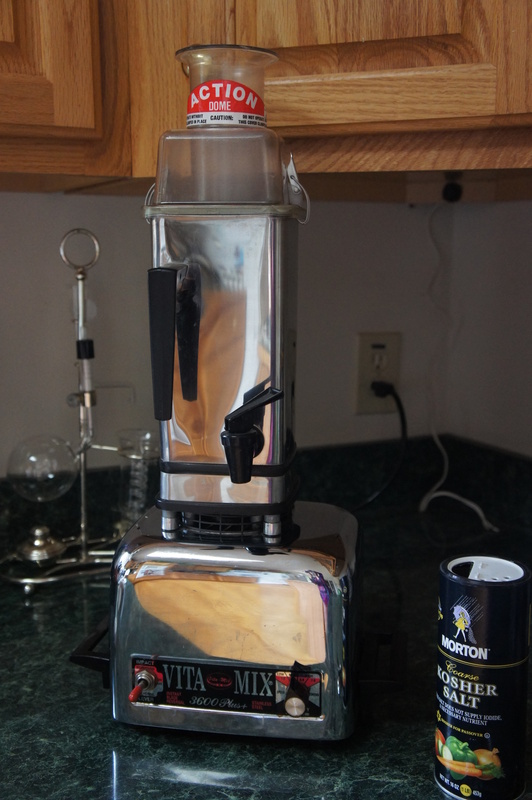 I used my Vitamix that we bought at a state fair back in the 80’s. 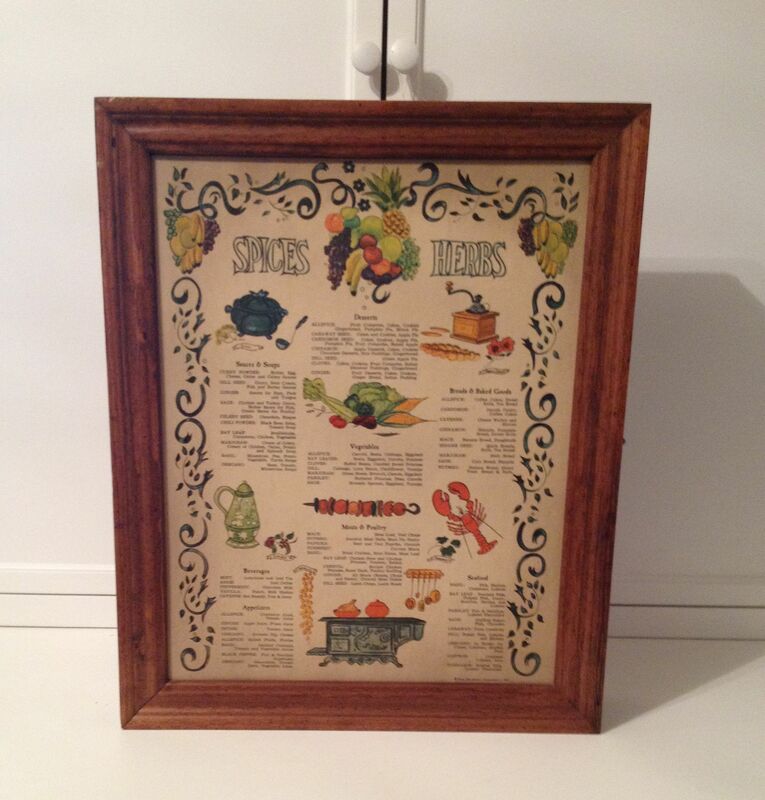 It’s a work of art, don’t you think? First, assemble all of your ingredients. 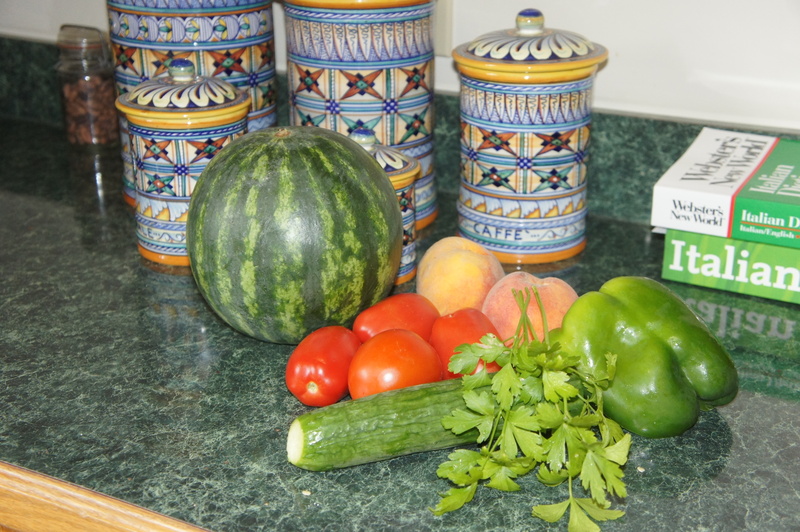 Remember, there is no substitute for the freshest and ripest veggies and fruits. Peel and seed the tomatoes. No cutting corners here. Peeling and seeding is not an option. Peel and seed the cucumber. I like to use the long English cukes, because the seeds are really tiny. 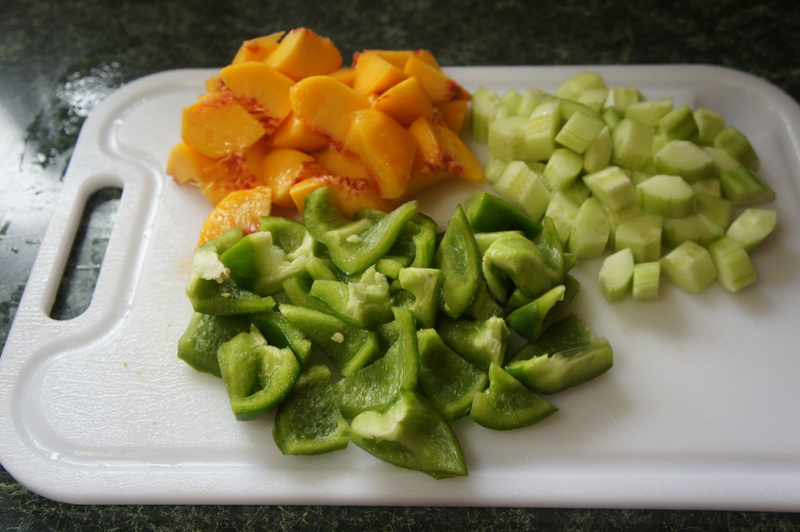 But particularly if you are using a regular cucumber, you need to remove the seeds. It’s easy. 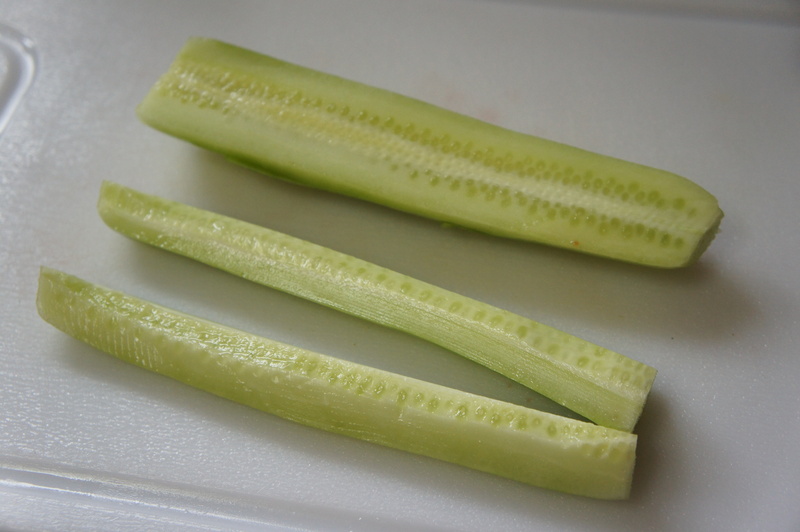 Just quarter the cucumber lengthwise, and cut the ridge off along with the seeds. Chop the rest of the ingredients and set aside. 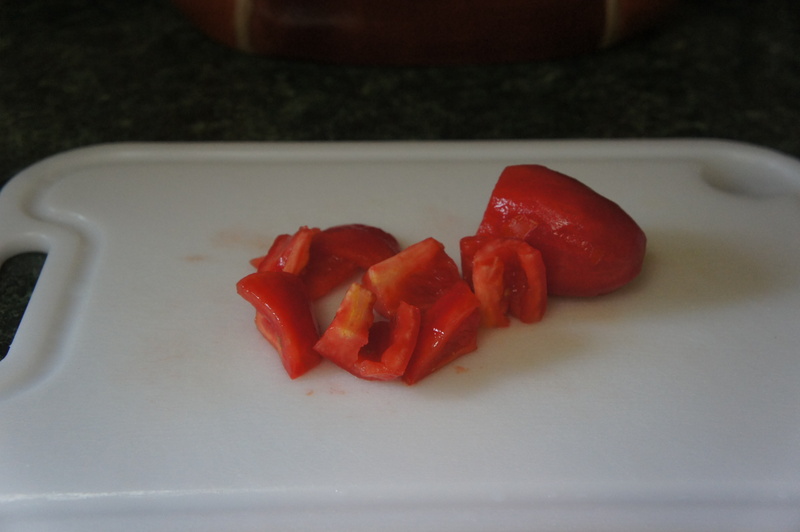 Throw the tomatoes, bell pepper, cucumber, garlic, basil and parsley into the blender and blend until smooth. Continue to blend and add the peaches. 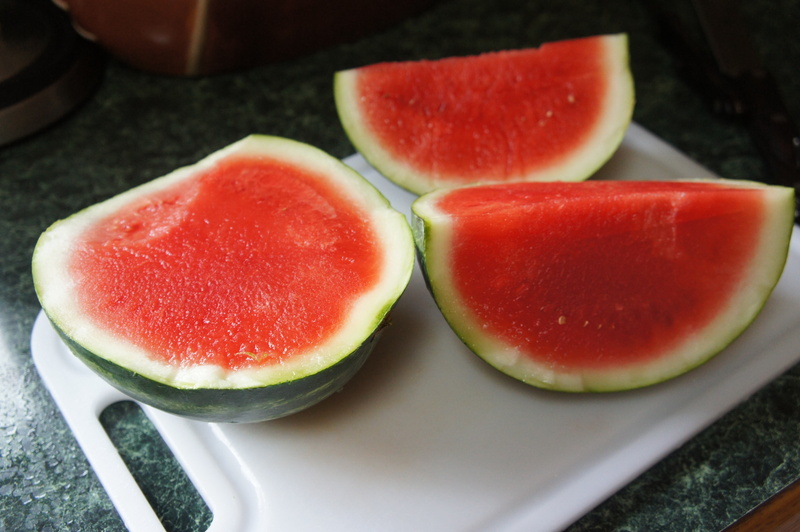 Now toss in the watermelon. You have a choice here. Do you want it slightly chunky, or smooth? I wanted a little texture of the watermelon, so I only pulsed the machine a few times. Then I stirred in the vinegar, olive oil, salt and pepper so as not to further mash the watermelon. Check it for seasoning according to your taste. 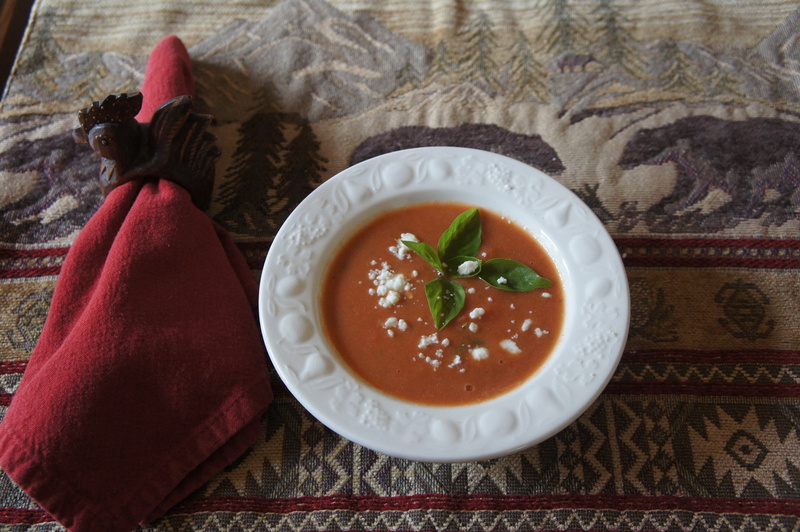 Place the soup in the fridge for at least 3 hours until it is chilled. One of the recipes I found suggested sprinkling Feta cheese on top. Initially I was a little conflicted about the addition of the Feta, but I had some on hand, so I did a taste test with and without, and “with” won hands down. If fact, it totally “made” the soup. So take my word for it and give it a try. Just be sure to crumble the cheese up really fine and just sprinkle on a light dusting. This is a recipe that begs for summer fresh ingredients, so try it now and enjoy before the season ends.